When we first wrote about Romina Kasman in 2014, she was a passionate student of our Center for Economic Education and Entrepreneurship (CEEE)’s master of arts in economics and entrepreneurship for educators (MAEEE) program. In the 2014 article, Kasman discussed her project, “Improving Global Citizenship Education,” which sought to improve financial literacy resources throughout Peru. Then, in 2016, Kasman returned to the University of Delaware as an alumna for a workshop with current MAEEE students. 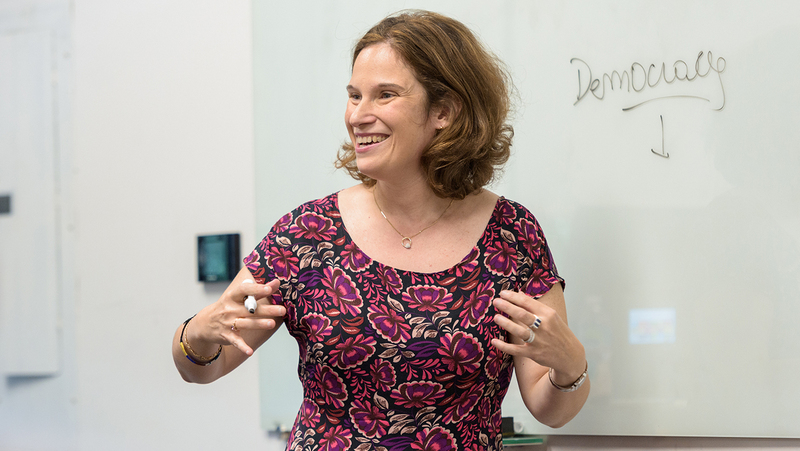 During the workshop, Kasman discussed her work at the Organization of American States (OAS), and how her work aimed to use education to help solve issues like poverty, governmental instability and social inequality. Today, Kasman has been appointed program coordinator at the United Nations Educational, Scientific and Cultural Organization (UNESCO). In this role, she will continue working for Latin America and the Caribbean, to strengthen efforts in countries in those areas to improve the quality and availability of educational resources. Q: Can you talk about the course your career has taken in the last few years since our 2016 article, and how you’ve gotten to this point? A: When you wrote about me in 2016, I was working at the Department of Social Inclusion at OAS, in the development of initiatives aimed to the identification of policies that contribute to more equitable and inclusive education. In 2017, I started to work again at the Department of Human Development, Education and Employment at the OAS as well – where I worked for 5 years, from 2011 to 2016, to coordinate the Inter-American Committee on Education. This is a body composed of all ministers of education of the Americas – 34 member states from Canada to Argentina and Chile – that promotes policy dialogue and cooperation between Ministers of Education. I worked on the organization of the Inter-American Meetings of Ministers of Education, which take place every 3 years, and the follow-up on the decisions adopted during the policy dialogue meetings. In April 2018, I moved to Santiago de Chile, to work at the Regional Bureau of UNESCO in Latin America and the Caribbean, located in Santiago de Chile. Q: How did it feel to be appointed to this new position with UNESCO? What exactly does your position entail? Working at UNESCO is a dream for me. I always dreamed about working there, not only because I believe in the mission of the Organization – “Build peace in the mind of the people,” – but also because I have seen how the organization worked in recent years, from a humanistic, integral and intersectoral approach, with governments and key stakeholders from around the world to ensure that every person has access to quality, inclusive and equitable education. The world has advanced a lot in educational development, but a lot more needs to be done. I believe that education is the key to achieve democratic and peaceful societies, with human development, equity and social justice for all. That is why I believe I have a unique opportunity working at UNESCO to contribute to the progress the world is making in education. My position at UNESCO is “Regional Programme Coordinator.” I am currently working at the Regional Bureau of UNESCO in Latin America and the Caribbean, which is located in Santiago de Chile. In addition to serving as a liaison with the national offices and clusters of the organization in the region, I monitor and prepare reports on the progress of the initiatives that we are currently implementing in the LAC region, in alignment with the themes prioritized by the organization and Sustainable Development Goal 4 of the 2030 Agenda. Due to my 15 years of experience on citizenship and civic education in the LAC region, I am also providing technical assistance for the development of global citizenship education, which is included in one of the goals (goal 4.7) of Sustainable Development Goal 4 of the 2030 Agenda. Q: How is your work at UNESCO progressing? What are your goals for the future? A: One of my goals in the future is to learn and work in other regions of the world to acquire knowledge and tools that will help me to come back to work in the Latin America and Caribbean region with innovative views and approaches to the issues that challenge its educational development. Building on my experience in Latin America and the Caribbean, I also believe that I will be able to contribute to the educational development of other regions. Throughout these years, I learnt that cooperation between countries is key to promote reciprocal development. In other words, the educational development of one country depends on the educational development of other countries from the same sub-regions and regions. Thanks to cooperation, countries can learn from each other, adapt, transfer and replicate experiences, take advantage of existing resources – avoiding duplication of efforts – and leverage new ones. In this regard, for the future, I would really love to work more on strengthening the capacities of countries to cooperate and articulate efforts and resources that mutually reinforce the impact of the policies developed. Q: Can you discuss how your time at UD helped prepare you for these latest developments in your career? The MAEEE provided me with theoretical knowledge and practical tools that strengthened not only my skills to teach economics and entrepreneurship, but also to lead the development of transformative educational initiatives in different sectors: governmental, civil society and multilateral organizations. Initiatives that will enable students and teachers to be agents of change of their institutions, communities and countries. The MAEEE transformed me as a person and as an educator. I believe there are some characteristics of the program that contributed to my professional development. One of them is the flexibility of the program, which allowed me to complement the mandatory subjects with other interesting knowledge and approaches offered through online courses and onsite trainings offered by other academic institutions, such as the University of Colorado Springs. The other is that the program requires students to develop two projects to apply the knowledge learnt to actual situations. Thanks to those opportunities, I participated in initiatives that enhanced my curriculum and allowed me to advance in my career. I advised governments in the development of national educational strategies on economic and financial literacy, developed research on financial and economic education policies, designed a manual on economic and financial literacy, and trained community leaders in Argentina, Mexico and Colombia on the topic. Finally, but not least, I would like to thank the Center for Economic Education and Entrepreneurship for the scholarship I was given. Without that it would have been impossible for me to access to this high quality education, continue studying at other universities and access to the job of my dreams. Q: What advice would you offer to others who want to make a difference in this field, the way you have? My advice is to be passionate about what you do and dream not only about your future, but the future of others. My inspiration is to transform this world into a democratic and peaceful one, with social justice, where every person fully exercises their right to access quality, inclusive and equitable education. You can make a difference if you can inspire and provide others with the knowledge and tools to make a difference too.